Welcome to Five Star Roofing. We are a family run business that have been established for over 20 years in the London area. We have built our business over the years on reputation and hard work, with 20 years of roofing experience you can be assured the highest standard of workmanship. We run a highly professional skilled roofing company that are willing to undertake Domestic and Commercial work. 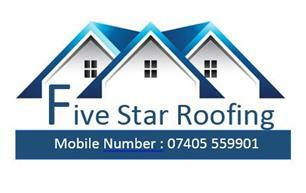 So when it comes to Commercial, Industrial or Domestic Roofing challenges, Five Star Roofing will find the right solutions for you and bring you all the benefits using a specialist Roofing Company, from start to finish of your project you will be assured of the very best service, value and quality. Call our friendly service today for a free quote.